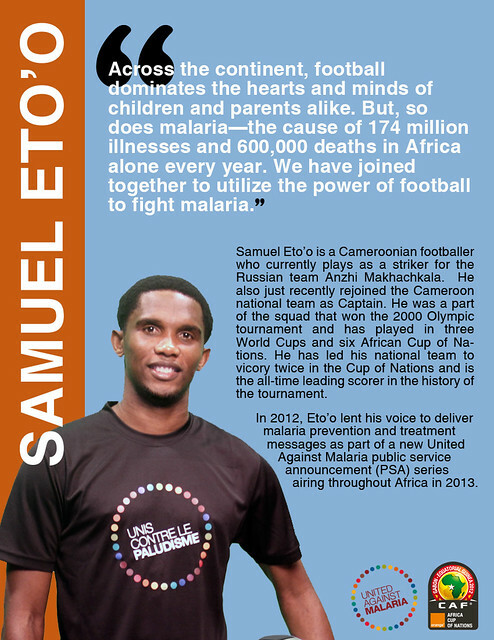 What is a United Against Malaria champion? A hero in the fight to control malaria infection and reduce malaria deaths. United Against Malaria champions use their influence, creativity, and resources to help prevent and treat malaria in endemic countries. They may buy life-saving insecticide-treated nets for employees and communities, help educate vulnerable populations, or raise the visibility of malaria to other influential decision-makers and call them to action. Their methods may be conventional or innovative, but all of them work tirelessly to achieve the vision of a malaria-free future. For renowned singer-songwriter and United Against Malaria champion Yvonne Chaka Chaka, one of the most powerful weapons in the fight against malaria is the human voice. 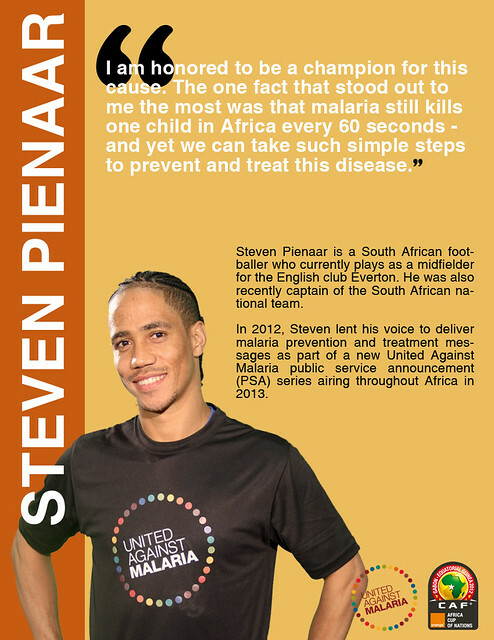 In February 2013, the South African superstar performed her malaria anthem "Hearts on Fire" during the closing ceremony of the Africa Cup of Nations—the continent’s premier tournament—to raise awareness and support for ending malaria. As she urged Africans to unite against malaria, her message filled a stadium of 80,000 spectators (incredibly, eight times as many people die from malaria every year) and reached a television audience of nearly 700 million. Sales of the song on iTunes will benefit UAM and her own charity, the Princess of Africa Foundation. An award-winning artist, Ms. Chaka Chaka has long used her voice to fight disease and social injustice. Beginning in 1981, she broke racial barriers in South Africa by becoming the first black child to appear on television. At age 19 as her sensational career as a pop musician took off, the world took notice. She too took notice of the world and its problems, particularly, malaria, which claimed the life of one of her band members in 2004. Shortly after, she became the first Goodwill Ambassador for the Roll Back Malaria Partnership—and she has since become UNICEF Goodwill Ambassador for Malaria in Africa, United Nations MDG Envoy for Africa, and Ambassador for the Nelson Mandela Children's Fund. In 2012 she became the first African woman to receive the World Economic Forum's Crystal Award, given each year to successful artists whose influence has had a positive impact on society. Voices for a Malaria-Free Future is grateful to Yvonne Chaka Chaka for dedicating her powerful voice to improving lives and defeating malaria. A Motherland Tour - A Journey of African Women: a documentary film starring Yvonne Chaka Chaka, who toured Africa to meet and celebrate women fighting to end HIV/AIDS, TB and malaria. Since 2006, Mr. Zake has been involved in Standard Chartered Bank's efforts to invest in malaria control—a combined $1 million through 2008, and another $5 million through 2013, benefiting 17 countries in sub-Saharan Africa. Through the NetsforLife partnership, the bank has had a hand in distributing almost 1.5 million nets in Uganda alone, often in remote areas where churches and faith-based organizations provide the only trusted delivery systems. Working with Voices, Standard Chartered Bank Uganda has educated its workers and partnered with UAM to raise awareness and funds for malaria control in the community, participating in UAM events since World Malaria Day 2011 and adopting pillars of Malaria Safe, UAM's private sector program. The bank has also made long-lasting insecticide-treated nets available to employees and clients at a discount. For his leadership and example to the private sector, Mr. Zake has been featured in the Ugandan press as well as the British newspaper The Guardian, which praised the bank for its partnership-building. "We thought that if we brought other organizations on board we could actually have a much wider reach, and that is exactly what has happened," he told The Guardian in February 2013. Mr. Zake also sits on the steering committee of the Private Sector Foundation Health Common Fund, which launched in May 2012 to benefit women and children in Uganda, with technical assistance from the Ministry of Health, and Voices. Under the leadership of Mr. Said, SSB launched a malaria treatment and prevention program to educate and protect its 6,000 workers. Beginning in 2008, the company distributed nets to its employees, made rapid diagnostic tests and medicine available in its clinics, and updated its malaria protocols. As a result, the company has cut its malaria-related treatment costs by two-thirds. Malaria-related absences have dropped by 80 percent. The payoff didn’t take long. “We have already, in one year, gotten a return on our investment in mosquito nets,” Mr. Said explained in December 2012. Sharing these successes, Mr. Said has addressed dignitaries, business leaders, and policy makers at the World Economic Forum in Tanzania, at the national Ministry of Health, and at private sector meetings in New York. He was also honored by the Prime Minister of Tanzania, Hon. Mizengo Pinda, during that country's November 2012 launch of Malaria Safe, a private sector program developed by Voices and UAM. To learn more about SSB and the Malaria Safe program, please see the Voices case study. The Prime Minister, who presided at the launch, has since appointed a Malaria Safe contact person within his office, written letters to 32 Tanzanian companies to encourage them to participate in the Malaria Safe program, and requested additional public funding for malaria control from various government entities. One of these is the Minister of Regional and Local Government Authority (RALG), whom the Prime Minister directed to allocate funds for malaria. Another is Tanzania Parliamentarians Against Malaria (TAPAMA), a parliamentary group that will meet with Voices next month to address district-level malaria funding gaps under the direction of the Prime Minister, in collaboration with four committees--Social Welfare, Community Development, HIV/AIDS and Local Government. A third is the Association of Local Authorities of Tanzania (ALAT). The Prime Minister has also written a letter to the Minister of Health and Social Welfare and to the Minister of Tourism and Natural Resources to promote Malaria Safe companies and to procure malaria resources. Finally, the Prime Minister has sent letters of directives to all Regional and District Commissioners to make sure that local governments increases malaria funding before district budgets are set up early this year. For his strong support, Hon. Mizengo Pinda (pictured above, at right) was invited as the guest of honor at last month’s United Against Malaria gala dinner in Johannesburg, an official event of the 2013 Orange Africa Cup of Nations. He was joined by South African Minister of Health Aaron Motsoaledi (pictured above, at left) and other dignitaries, business leaders and celebrities who are working diligently to create a malaria-free future in Africa. "I'm personally very excited because the Malaria Safe initiative that we launched last year in Tanzania is already bringing about some very good results," he told audience members. "Malaria can't be fought alone with the budget of the government. We've got to get everybody to contribute a little bit. Through the private sector, it's working very well, because most of them have taken up the program of providing mosquito nets, etc. It can be done." Ghana Football Association (GFA) president and Confederation of African Football (CAF) executive committee member Kwesi Nyantakyi has championed the United Against Malaria (UAM) campaign since its inception in 2009, bringing visibility to a deadly disease that is responsible for 22 percent of deaths in children under the age of five in Ghana. 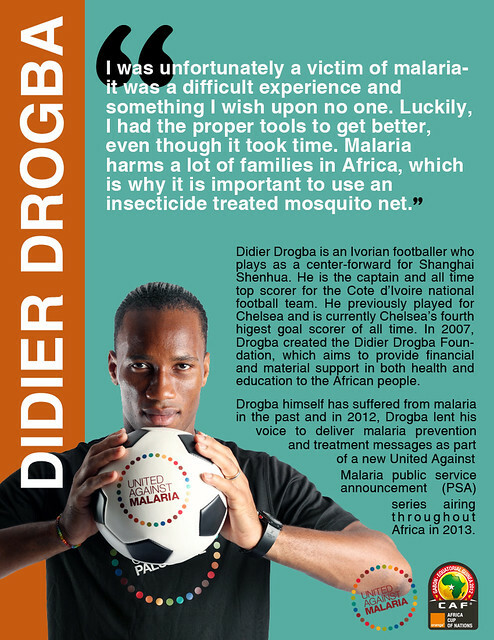 During the qualifying games of the 2010 FIFA World Cup, the Ghana Black Stars, played Mali in a match dedicated to the fight against malaria, with oversized mosquito nets hanging in the stadium and UAM messaging on the field. They also recorded public service announcements, which have been aired across national television networks in Ghana around the World Cup.